Angels. Demons. Humans caught in the middle. Heroes trying to resist temptation and defeat Satan’s emissaries. Sounds a lot like an adventure yarn from the mind of Frank Perretti. But Francis Lawrence’s action-horror flick Constantine is a far cry from This Present Darkness. While the hero is an exorcist casting out demons right and left, he’s not exactly driven by humility or selflessness. And he’s not too fond of God. 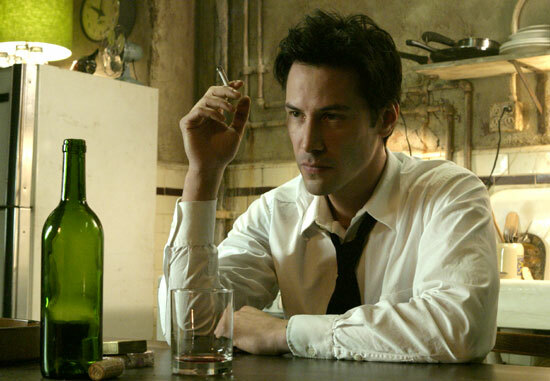 Keanu Reeves plays John Constantine, a chain-smoking exorcist who knows he’s going to hell after his lung cancer does him in. He spends his days trying to earn his way into God’s good graces by investing in his favorite side of the cosmic battle between good and evil. That’s the premise. The studio execs were excited about marketing this movie to Christian moviegoers. It has angels and demons! Surely Christians will eat this up! Well, Terry Mattingly at GetReligion sat bewildered with the rest of us religious-press journalists after the L.A. screening of Constantine. We were all trying to make sense of this spectacular mess. Today, at GetReligion, Mattingly highlights some words from the angel Gabriel … or rather, some words from the actress who plays him (her? it?). Tilda Swinton contradicts the other cast members and the director, who said it’s not a political film. Wait until you read her interpretation of the movie. Constantine doesn’t have a moment of meaningful insight when it comes to Christian spirituality. In fact, it can’t say anything worthwhile. It’s too busy choking on its murky theology and crooked logic, and it delivers more than its fair share of gratuitous violence and gore. But it’s going to be a hit, due to its star power and special effects. So, since moviegoers will be buzzing about it in the coming months, CT Movies posed some questions to the filmmakers about the movie’s ideas about good, evil, the afterlife, and redemption. Lawrence and Reeves joined screenwriters Kevin Brodbin and Frank Capello, and supporting actors Rachel Weisz (The Mummy Returns), Djimon Hounsou (In America), Shia LeBeouf (Holes), and Gavin Rossdale (of the rock group Bush), in L.A. to address questions (paraphrased in this article) from religious press journalists. Does this kind of movie scare you? Rachel Weisz: I don’t like it actually. It’s not scary to make the movie, but it’s scary to watch it. It’s not a feeling I enjoy. [This one’s] right on the edge of what I can handle. When you’re doing something very intense, I like to be silly, make a joke, let off steam. We don’t walk around thinking about demons. It’s make-believe. I get paid to make believe. I’m very lucky. Djimon Hounsou: I may seem cool and collected, but I don’t really like watching movies of this nature. Just the fact that we did it meant I had to watch it. But otherwise, I wouldn’t go. I don’t have the nerves for it. I used to, when I was a lot younger. But now I just can’t deal with it. And I just don’t see the need to have my hair stand on end. Rachel, looking over your career, this seems like it may be the first film you’ve been in that deals heavily with supernatural stuff—except for The Mummy, of course, which approaches it in a Saturday Morning Cartoon kind of way. Was it discomforting to you at all to work within a story based on such a strong religious tradition, which people take very very seriously? Does it resonate with you as true, on any level, in your personal life? Or does it feel more like an elaborate comic book language? Rachel Weisz: I’d never read the comic books. So I was coming to it without knowing about that huge comic book cult community. The world it’s set in, with angels and demons, is Judeo-Christian mythology … from the Old Testament to the New Testament. I’m familiar with those two books. That’s what I was raised reading. So, did it bother me? No. I thought it was very interesting. Obviously it’s a Hollywood movie. Obviously it’s entertaining and scary, but it’s set within a universe where really important questions are asked. These are very serious themes and questions housed within an entertaining Hollywood movie. I don’t see why one can’t have both. What kind of meaning do you hope viewers will take away from seeing Constantine? Francis Lawrence: I hope viewers get the simple story—the hero’s journey. You have this guy who’s dying of cancer and he knows he’s going to hell. He’s trying to prevent it. He’s a selfish guy, doing things for selfish reasons. And then, he has that turn. It’s a movie about redemption. Down underneath that, there are [other] ideas that we play with—like the perception of good and evil. What is good? What is evil? It’s not just what we’re told is good and evil. We have to think about that for ourselves. But you don’t have to be Catholic to relate [to Constantine]. There are these broad ideas that work for a lot of people, spiritually or philosophically. Shia LeBeouf: I don’t think this movie was made to push ideas or philosophies on anybody. It’s a fun ride. It’s purely for enjoyment purposes only. I think if somebody walks into it with a serious mindset, it could permanently affect them and give them nightmares they don’t want or put them in a place they don’t want to be. I understand that it’s dealing with religious philosophies, and there’s probably a lesson in the film. But I don’t necessarily think anybody’s walking away from the film going, ‘Wow, that’s right. You know what? Now I’m going to change my life because of that.’ I don’t think that was the purpose of making the film. It’s not The Passion of the Christ that we’ve made. Rachel Weisz: It’s about the capacity that we as human beings have to do good or to do evil. Good and evil occur on the earth, and we have freewill. We can choose. But there is also a question of predestination—God’s will. There’s a tension between these two things, and it’s in a state of flux. It’s one of the biggest questions you can ask. For me it’s a question that is unanswerable. We can’t say to what degree we’re in charge. We don’t know these things. It’s a mystery. Gavin Rossdale: It’s a wonderful thing that this movie [shows] us: the power of change. It’s so poignant, so resonant. Constantine shows us this man’s journey, what he learns about himself, and … the satisfaction that comes from giving yourself away. It gave me the shivers when I watched it. I’m so proud to be part of this film because it has a positive message. Frank Capello: The idea of redemption came about [partly] due to casting Keanu. Keanu’s a very spiritual person in his own right. He basically believes that we all have a purpose here. Keanu Reeves: I think of it as just a kind of secular religiosity. The piece itself is using icons and a platform of a kind Catholic heaven and hell, God and the devil, human souls, fighting for those. But … I was hoping that these concepts could become a platform that [is] humanistic … that the journey of this particular hero is hopefully relatable to [viewers] — even though they’re such fantastical characters and situations. It’s still a man trying to figure it out. I think those kinds of journeys—the hero’s journey or with Siddartha—these are all kind of seeking aspects [that] have some kind of value to our lives … that we can take with us. And they’re entertaining, you know. They offer up [questions like] ‘Where have you come from?’ ‘What are you fighting for?’ ‘What is striving against you?’ [They’re about] coming into a kind of grace … into a kind of light. I think they’re worthwhile. Do you think good and evil exist in a balance, or is one of them stronger? Djimon Hounsou: I don’t think evil is stronger, or I don’t think any of us would be here! What is the balance? I don’t know. I don’t know that I have the ability to see that. So that’s one subject I’ll leave alone. Francis Lawrence: I believe that the world exists in a polarized way. For there to be good, there has to be evil. There are people around us who have these kinds of energies about them. I think there are two equal forces—there is a balance, and when it shifts one way or the other, something changes. You need one to have the other. Gavin Rossdale: Ultimately, I believe in good over evil. Whatever the balance—why is it that this movie shows us so much hell, and so little heaven? Frank Capello: That’s the point of this story—that it has changed, the balance is shifting, something is going wrong. [Good and evil] are supposed to be equal, they’re supposed to be balanced. So then why are we seeing demons? The balance is upset. Constantine … helps balance it out. Francis Lawrence: [Heaven] is definitely part of John Constantine’s world. It just wasn’t as much a part of this story, because he had to do the fighting. From his ultimatums to demons, we know that John Constantine clearly understands that one must ask for God’s forgiveness to be forgiven for sins. Why does he insist on working his way into heaven? Why doesn’t he repent and ask God for forgiveness? Frank Capello: He wouldn’t. That’s the thing about his character—his pride gets in the way of him asking to be let off the hook. He basically says, ‘I’m going to do it myself. I believe in myself.’ When you believe in yourself, you’re not going to ask for help. You don’t want to lower yourself to beg. And that’s what he almost does. When you walk that line with John Constantine, knowing there’s a heaven, knowing there’s a hell—there’s no faith there! He knows it. He’s not going by blind faith. He’s been there. He’s seen it. What we all wish we knew… some people accept it totally, some people say, ‘Prove it to me. I have to see it.’ John’s seen it. The idea of redemption came about [partly] due to casting Keanu. Keanu’s a very spiritual person in his own right. He basically believes that we all have a purpose here. Keanu Reeves: Repentance. I think the aspect of repentance is born and expressed in his act—I don’t want to give it away—but his final act, what he asks from, as he calls Lucifer, ‘Lu.’ That’s his repentance, and I think—and his sacrifice, and what goes on there—I think that’s what .. gives him a shot at going Upstairs. But there’s also the Constantinian twist of did he make the sacrifice so that he could go to heaven, or does he really mean it? But … ultimately he does. Otherwise the Man Upstairs knows –just like Santa Claus—if you’re telling a lie or if you’re really nice. He knows. What was it like, working on a movie set, surrounded by the symbols and the language of this religious tradition? Shia LeBeouf: I’m not extremely religious. I’m still finding myself. I’ve always thought there is a presence—I do believe in God. I don’t believe in any certain scripture, per se. I was raised Jewish, but I just don’t feel it. [He laughs.] Like any Jew in Los Angeles, after your bar mitzvah, you’re pretty much through being Jewish! And the priest is so serious, it wobbles you a little bit. You think, ‘He’s really taking this seriously. There’s a reason. He can’t just be some crazy. They’re bringing him in on this film to help us, to guide us in the religion, in a way. He has expertise on this, he’s gone to a university, and people follow him … so he can’t just be some nut job!’ So you take that into account. And if he’s teaching you how to exorcise people, then that means it happens! This happened every day: You’d be sitting in the cab, and you’d see a Satanic Bible. You’d pick it up and [go] through the pages and it would start scaring you. There was so much material on the set to read and to find things that you didn’t want to find out. Djimon says this a lot—you didn’t want to go in-depth with the research for your character, because you might find yourself in a place you don’t want to be. Djimon Hounsou: I think this is one of very few projects you’d ever want to be involved in where you don’t really research. This is one subject you don’t want to do much research on it. It’s only given to very few people to have the ability to take those things in. I strongly feel there are certainly things that are not for everyone to hear or see. For example, Jesus Christ. Jesus Christ is one of those people that I think exists that does have that unique ability to see—they can read you, inside out, like a book. They know your story even before you discover where you’re headed. That makes Jesus Christ a very special being, a very gifted being. I think [the character of] John Constantine is kind of like that. We talk about [these people] as if we are equal to them, but we are not necessarily given to be receptive to certain things. Francis Lawrence: It’s a fascinating world. That’s part of what draws some people to films like this—that fascination. A lot of people have an interest until that moment when it might be too close to them, and then they say, ‘No, I don’t want to know anything.’ There was a little of that on the set. People wanted to be very cautious and respectful. What relevance does this story—the conflict good versus evil, God versus the devil, and the possibility of redemption—have for you in your daily life? Is it a real thing? Or is this all just comic-book fantasy to you? Djimon Hounsou: One connection it has for me for me: Africa, and certainly my country [of Benin], is a source of voodoo. Being born there, growing up there, I heard firsthand some stories. The relevance it has in real life for me has to do with the way I carry myself and the way I treat people and … interact with people. If heaven and hell exist, it may be just a condition of our minds. I truly believe those two worlds do exist. If they don’t exist in the sense of God or the devil, they exist in the sense that what you do and how you carry yourself in this life experience leads you to a better life in the afterlife. Francis Lawrence: I don’t think these things do exist, I don’t think they don’t exist. I’m the person who doesn’t know, and who’s open to all ideas. I was raised by parents who were both lapsed Catholics. My mom was raised Catholic and fell out of it, and my dad was raised Episcopalian and fell out. So I have this weird mix of having Catholicism in my life and real science and logic in my life. I’m somewhere in between. Maybe some of that came through [in the film]. Gavin Rossdale: I consider myself a very religious person, but on a much more personal level than the structured religion of necessarily following a particular denomination. I feel very close to a higher power, which I’m used to calling ‘God,’ but I wouldn’t force that on someone else. I would just hope that they have some idea that [serves as] a conscience. I think that kind of struggle goes through people every day—this idea of temptation, the idea of selfish versus selfless. I firmly believe that you can’t just explain things away on society, or on your childhood. There’s a real sense of evil that is the only explanation for atrocious acts that happen to innocent people on a daily basis. It’s very sad. 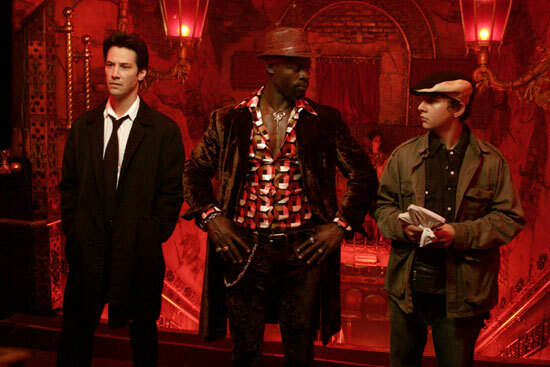 Keanu Reeves: Spirituality is a word that I really don’t feel is something to apply to Constantine. If is, it’s very humanistic—as it always is, obviously. It’s more ‘flesh and blood’ than spiritual. Rachel, your character Angela has a sister who is locked up in an institution because she has this spiritual awareness and is considered crazy. Does that resonate with you as something that is actually happening in culture, where we are stifling serious things with drugs or other repressing agents? Rachel Weisz: We live in a culture where there’s a pill for everything. It’s no coincidence that the pharmaceutical industry is a multi-billion-gazillion dollar industry lobbying the government all the time. I think it’s a tragedy that oftentimes children just need to be listened to. They need some extra help in some area, and they’re medicated. It’s the same with adults. We’re living in a terrifying time in terms of medication. Everybody is bi-polar. How did this happen? That can’t be! It’s a scary thing. This is a horror movie, but that’s a horror in real life. These characters seem alienated from their families, from each other, and John is clearly alienated from God. Do you think that is meant to mirror some alienation manifest in our own society? Rachel Weisz: The breakdown of the relationship between man and God, and the breakdown of nuclear families … society is moving more and more toward very alienated individuals. Individuals are on computers all day, and [they’re] not interacting with other human beings, not being part of a church, not being part of a community. They’re [interacting] less and less. People are alone and alienated. Playing computer games—for me, that’s a very alienating thing to do. Anything where you’re not in relation to family, friends, community, God … that’s alienating. So yes, I think the movie is holding up a light to something that’s happening in the world, even though it’s a completely supernatural kind of [story]. But it is the world, isn’t it? It’s a world with supernatural edges that take over. I would say [the movie’s] a comment on that. Shia, as a young actor, who do you look up to? What actors do you admire for their career, their public persona, their choices? Shia LeBeouf: There’s people I want to emulate, careers I want to have, resumes I’d like to attain. My route is very original. I don’t necessarily want to be a comedian forever. I’m a dramatic actor at heart as well. That’s why the comedy works so well. I’m trying to mix it up as much as possible. In October, there’s an epic film called The Greatest Game Ever Played which is a completely different role. I’m also trying to grow with my audience and raise them. I have to maintain quality, or they’re going to be like, “Oh, no. This is another Raise Your Voice. Goodbye!” I just have to make sure I’m consistent with the quality of film that I pick and the role that I pick. Maybe Dustin Hoffman would be my favorite actor. And my favorite career would be Tom Cruise or Keanu Reeves. Thanks for the fair warning, Jeffrey. It seems the more I try to remain cool, distant and collected, the more I try to remember that the last two installments were huge disappointments and the first three weren’t really all that great and life-changing to begin with, the more I think of the cheesy animation in the Clone Wars series I just saw yesterday and about the illogical lines between the old trilogy and everything new, the more I’m secretly sliding into association with all things Jedi. Dude, I want to read Ebert’s review, but I know if I do, I’ll just wet my pants. Darth Vader’s theme is just too wrapped up in my psyche. I can’t control myself no matter how much I know I’ll be disappointed. Aaarrghh! Who will save me from this wretched life of Sith? I think the line was actually, “Only a Sith deals in absolutes,” in response to the, “If you’re not for me, your against me line”, which I believe is supposed to be an echo of George W. Bush’s, “If you’re not for me, then you’re my enemy” line from (I think) his state of the Union address. I think the difference between “deals” and “thinks” is pretty significant, at least in terms of human to human interaction. …and my grammar are bad. For me, not “dealing in absolutes” is very different from denying the existence of absolutes, and I don’t think it stops us from commenting on others’ decisions. I don’t deny the existence of absolutes, but I am very sceptical about my own ability to grasp them or to communicate them. That’s partly tied in with how I interpret Paul’s whole “through a glass darkly” thing. When I act as if I have a connection with an absolute, I’m most likely to be judgmental, to act as if another person can be consider wholly good or wholly bad. It’s when I’m at my worst. But acknowledging our own weaknesses does not prevent us from offering an opinion (“it seems to me that if we take into account X and Y, we may find that Z is a better solution to this situation”). It makes such conversations harder, but it seems to me that it also makes them more honest. I haven’t seen Sith yet, but it would seem to me that this line fits pretty well with some other parts of the series. For the Emperor (and for Vader, for a time) their way is the only way. For much of the Rebellion, Vader is wholly evil. But for Luke things (at least where Vader is concerned) aren’t quite that black and white, and there is a part, even of Vader, that can be saved. If you’re right about the line, then you’re right in your assessment of it. But A.O. Scott quotes it as “Only a Sith thinks in absolutes.” That makes the issue very foggy for me. I wish I could see it again to know for sure, but alas, I’ve got to publish this review. Every review I have read that mentions this lists the line as “deals in absolutes”, but I could have SWORN I have seen footage of this scene on the Net, as well. Ironically, in Episode VI, it is Obi-Wan who thinks and deals in absolutes and encourages Luke to see Anakin as “twisted and evil” for the purposes of assassinating him, even as he espouses Palpatine’s “point of view” thinking — ouch, my head is hurting already. The original trilogy didn’t have too many internal contradictions. Yeah, the final lightsabre duel between Luke and Vader made absolutely No Sense Whatsoever (Vader blocks Luke from succumbing to the Emperor’s temptation … only to try to tempt him some more? ), but I could live with it. These prequels, though, have just made a hash of the whole thing, and have exposed Lucas for the incredibly muddled thinker that he is. About the Photo… Don’t know what you saw, but I noticed that all 3 characters are all in exactly the same pose – standing on right foot, left leg bent bad, right arm forward, etc. Is that what you were getting at? I am probably missing something much “Cooler”, but didn’t want to let you down by not commenting! Dude, that’s the corridor in which we first saw 3PO and R2 in the original Star Wars movie! Re: the “temptation” scene in Episode VI. For now, let us ignore the prequels entirely, and their revelation that there can never be more than two Sith lords at any given time. If we took the prequels seriously, then we would have to believe that it would have been impossible for Palpatine, Anakin and Luke to be Sith lords all at the same time; in other words, if we took the prequels seriously, we would have to believe that, when Vader suggested to the Emperor that Luke would “join us or die,” the Emperor must have heard that as a challenge (as indeed it may have been, since Vader tells Luke that, together, they could destroy the Emperor). But like I say, we’re going to ignore the prequels. Let us simply look at Episode VI on its own terms. Palpatine tells Luke, “Strike me down with all of your hatred, and your journey towards the Dark Side will be complete.” Luke finally succumbs and reaches out with his lightsabre to kill the Emperor … but Vader blocks his attack. Why does Vader do this? To prevent Luke from going to the Dark Side? No, he proceeds from that point on to do the tempting himself. To encourage Luke to go to the Dark Side, then? No, if that was what he wanted, he would have let Luke kill the Emperor — indeed, in Episode V, Vader himself had told Luke that killing the Emperor was one of the things Luke could do if he went to the Dark Side. So you see, that whole temptation sequence makes no sense. And then, of course, there is the point that David Brin has made, that there would have been absolutely nothing wrong with Luke killing the Emperor anyway, no matter what the Emperor might have said about it. Luke is a soldier. Killing enemies — and especially a chief villainous enemy like Palpatine — is his job. And many soldiers have killed people without becoming Hitler-style bad guys like Vader. Emperor: An entire legion of my best troops are waiting for them! Luke: You mean, my friends are in trouble? Luke: Does this thing have a self-destruct? Computer Voice: The Death Star will self-destruct in five minutes. Luke: C’mon dad, let’s get out of here. Honestly though, I always thought that Luke was so angry about his friends being tricked that he turned all his aggression against his father, and was not taking his lightsaber to strike the Emperor down, but was taking it to strike his FATHER down. In fact, in over a hundred viewings I don’t think I have ever seen it the other way, though I am going to look for this the next time I watch it. In regard to the whole “there can only be two” thing, I don’t know if I should defend Lucas, here. At first, I thought this just meant, when there is a master, there is an apprentice, and there could be a million sith as long as every learner had a master. After the second prequel, I wasn’t so sure. If your interpretation is true, I guess the Emperor could just use Luke as his lapdog, and not neccessarily as a Sith, but that is almost getting into semantics, which is just ridiculous. If we ever meet in real life, I suggest some type of Star Wars pub-roundtable discussion. While I agree that the series has fundamental inconsistencies and that the prequels have only further muddied the waters, I don’t think that “Always two there are” creates nearly the level of difficulty being suggested here. The principle, as I understand it, is that every Sith apprentice wants to destroy his master, and every master tolerates his apprentice only insofar as he believes he can control him. Eventually, either the apprentice destroys the master and becomes the new master with his own new apprentice, or the master destroys the apprentice and takes a new apprentice himself. Sometimes, as in The Empire Strikes Back, the apprentice (Vader) may hedge his bets by trying to line up an apprentice of his own before taking on the master. However, such a third recruit could also very easily become an antagonist to the existing apprentice, and a Sith lord with an ambitious apprentice may very well try to maneuver his apprentice into combat with a possible replacement. Whichever one wins, he will only have one subordinate to deal with, not two. Needless to say, all of this is beneath the surface for the Sith; they don’t exactly talk about it openly. It’s like the surface courtesies of Screwtape and Wormwood in The Screwtape Letters; neither is going to come right out and say that they’re maneuvering to try to devour one another, but at the same time no one has any illusions what’s going on either. It may even be something that the Emperor realizes but Vader doesn’t. Vader might really think that there could be three Sith, a master and two apprentices, at least for a time. Ideally, he may want to recruit Luke to his side and destroy the Emperor, but for the time being he may be satisfied to see the Emperor take Luke under his wing along with himself. The Emperor, though, must know or suspect that Vader wants to recruit Luke and destroy the Emperor. By the same token, he wants to use Luke in precisely the same way he used Anakin in the opening act of Revenge of the Sith — pit the new recruit against his current disciple, and dominate whichever one survives. All of this, I think, can reasonably be inferred from the films without any excessive leaps in interpretation. A trickier question, as Peter has pointed out is: Why does Vader block Luke from destroying the Emperor, since he’s already said that that’s what he wants to do anyway? And why is Luke killing the Emperor such a dark-side thing anyway? These are questions the answers to which I DON’T think we can reasonably infer from the films without a leap that the film hasn’t earned. Clearly, the Emperor knows that Vader will stop Luke from killing him — even though Vader evidently wants to destroy the Emperor. Could it be that Vader knew the Emperor was so powerful that Luke’s attack was no threat to him whether or not Vader blocked the stroke? And therefore he parried so as to maintain his show of loyalty? Or could it be that both Vader and the Emperor know that Luke killing the Emperor in that moment WON’T turn him to the dark side after all — which, despite their cross purposes, they both want him to do — and the point is simply to draw him into combat with Vader, and thereby to provoke him to the wrath and hatred that would draw him to the dark side? The movie isn’t coherent on this point. But I don’t think it quite falls apart at the level suggested above by the “Always two there are” rule. OR, could it be that, just as Anakin chose to save the Emperor from a Jedi in “Revenge of the Sith,” he is here choosing once again to shield the man who mentored him in the Dark Side? This would make his later decision, to throw his own mentor into the pit, all them more significant. Sometimes, as in The Empire Strikes Back, the apprentice (Vader) may hedge his bets by trying to line up an apprentice of his own before taking on the master. However, such a third recruit could also very easily become an antagonist to the existing apprentice, and a Sith lord with an ambitious apprentice may very well try to maneuver his apprentice into combat with a possible replacement. Very true. The problem here, of course, is that it is the Sith apprentice (Vader), and not the Sith master (Sidious), who lines up Luke as a possible replacement. And Vader openly tells Sidious that he is lining the guy up. Footnote: It is interesting how both Vader and Sidious tempt Luke by telling him to attack them. Sidious does this explicitly, of course, but even Vader seems to do this, too, however implicitly, when he walks around in the shadows with his lightsabre drawn, telling Luke he can’t hide forever and so on. Yet we never see Sidious try anything like this in the prequels. It may even be something that the Emperor realizes but Vader doesn’t. Vader might really think that there could be three Sith, a master and two apprentices, at least for a time. I doubt it. The Jedi have been looking for the Sith for basically all of Anakin’s life, and the Jedi even spell out the two-Sith-at-a-time principle right from the beginning in Episode I. There is no way Anakin could have missed the fact that the Jedi were looking for two Sith lords. Add to this the fact that Vader is the Sith apprentice for something like 25 years — a quarter-century! — and it doesn’t seem that any of the other Sith apprentices we know of had to put up with their place in the pecking order for so long. Vader would have had more than enough time to figure out how the Sith run things, even if the Jedi hadn’t filled him in. Ideally, he may want to recruit Luke to his side and destroy the Emperor, but for the time being he may be satisfied to see the Emperor take Luke under his wing along with himself. This is certainly what Vader seems to think will happen, in Episode VI, when he meets Luke on Endor. It is one of several signs, in the final film, that Vader’s evil and/or power has become somewhat diminished since we last encountered it in Episode V.
Count Dooku seems kind of shocked that Palpatine is willing to kill him. He should have known better. 2. Uses the force to grab his lightsaber. 3. Immediately turns to Vader. 4. Vader ignites his lightsaber. Because of the use of angles, this is arguable, but the scene still looks this way to me. I think my opinion is augmented by the fact that Luke swings directly at VADER, and Vader parries. Luke’s swing is directed nowhere near the Emperor. Also, Luke striking down the Emperor at that exact moment would be a bit out of character. Luke was being offered his weapon, though, so I can see why he would at least take it. The scene is very open to interpretation, if you ask me, and I think the Dooku vs. Anakin scene from ROTS (mentioned previously) only adds to this. Vader would surely remember being put in the similar situation, only not as the young upstart in ROTS, but as the gray (and curiously tall) old-timer. Also, I always thought that Vader says, “He (Luke) could be turned” to the Emperor almost spur of the moment, obviously because he does not like the prospect of having to murder his own son. Not that Vader wasn’t juggling the idea before, in fact, the Emperor may have perceived that Vader had this idea, and by telling Vader, “The son of Skywalker must not become a Jedi”, forced Vader’s hand. Then again, I am told I look at things a lot differently from other people. I wonder if George Lucas thinks about his OWN movies this much? Several weeks ago, on the drive home from a friend’s home, I received a wonderful vision that thrilled me. My friend and I checked out a preview of Ep. III on the official Star Wars site. The trailer we saw closes with the Emperor and Vader standing side-by-side, arms folded, looking out the window of a star destroyer. Maybe I’ve been reading way too much John Eldredge, but that closing image transfigured into Christ and I standing side-by-side, arms folded, looking out from some vantage point. It was very empowering. I’d recently been studying the ascension — the fact that I was not only put to death and resurrected with Christ, but I am also seated in Heaven, as e is, with the angel armies at my command. I was invigorated by this image in my mind. Immediately, I pictured Christ and I walking the streets of my city flanked by angel armies, as Vader and Palpatine march through stormtrooper ranks on the Death Star in Ep. VI. Those red cloaked imperial guard dudes became the cherubim around the throne. All of this really appealed to me, because I have always bucked at the idea of being a bond-servant to Christ. Cinema and literature have not provided me with an adequate example of a master/pupil or master/slave relationship that translates into my Christian experience. Either the pupil surpasses the master or the servant is little more than a glorfied go-getter, but Vader, now there is a powerful and awe-inspiring pupil/servant. He goes about the universe, second in command, living only to do the will of the Emperor. As stated, I’ve yet to see Ep. III, but this is what I imagined. He was marred, but the Emperor restored him, and gave him a new body. I was relishing the parallels. Alas, I just re-watched Ep. IV, V, and VI, plus I have read through your discussion, and other others like it around the net, and my image is smashed. Vader was plotting against his master. Though my imagination has inverted the Empire into Heaven, I can’t tolerate the inconsistency of doing the will or Christ, at the same time plotting his downfall. Well, there you go… I’m back to associating servitude with being like Gunga Din. How could I be so foolish? Bloody, John Eldgredge and his divine-encounter-nonsense-that-God-will-rename-you-something-strong-and-masculine-like-Henry V- or-William Wallace! Also, Luke striking down the Emperor at that exact moment would be a bit out of character. You mean, it would be more in character for Luke to do something stupid? I dunno, Mark Hamill may be a bad actor, but Luke is a smart cookie. Luke knows the Emperor is in charge of the Empire. He knows killing the Emperor would go a long, long way towards ending the war. I don’t see how killing yet another member of the Imperial military regime would be more out of character than lashing out at a member of his own family who happens to be one of the Emperor’s currently-not-so-relevant underlings. I was wrong, though I must say, this scene could have been edited better, unless my previous opinion is correct, and it was shot this way to keep it open to interpretation. Also, though I know you’re sort of kidding about the whole “Somalia writ large” thing, for the kind of people who really care about that sort of thing, we have the expanded universe (mainly the novels), which tell us the Senate is reformed (and basically falls into some of the same problems it did before), and that there are warlords who must be defeated (and mostly are, until all that is left is an Imperial remnant that makes peace with the New Republic). Also, though I know you’re sort of kidding about the whole “Somalia writ large” thing, for the kind of people who really care about that sort of thing, we have the expanded universe (mainly the novels) . . . Which are completely apocryphal, despite whatever Lucasfilm might have said about them in the past. One of the few things I liked about Episode II was the way it completely snubbed the whole premise of Kevin J. Anderson’s Jedi Academy Trilogy and Darksabre novels, by revealing that the Death Star was not designed by some naive little alien who went on to become Wedge’s lover. Anderson is an awful writer, and it was frightening to see how dominant he became within the Expanded Universe in the mid-’90s — he was a big reason I stopped caring about the Star Wars novels, so it was fun to see George Lucas completely ignore him like that. Along the lines of story incongruity and Uncle Owen, it always seemed to me that Luke’s aunt and uncle knew a great deal about Anakin Skywalker. The level of Owen’s anger toward Anakin and Beru’s knowing looks betray intimate knowledge Anakin’s past. However, the level of Owen’s feelings seems strange to me as they are in no way blood related. Why is Owen so disturbed by Anakin’s lifestyle, or what he knows of it? Does he know Anakin became Vadar? If Obi-Wan brought Luke to him to raise, was he told all the details, or just that Anakin was “dead”? Owen is a pretty straight-laced guy, so perhaps he dislikes Anakin on principle and thus projects that onto Luke when he sees similarities. Owen obviously wanted Luke around to help farm, but I keep thinking about the strength of his feelings about Anakin…why so strong?